July 13th was a great day for breaking records. 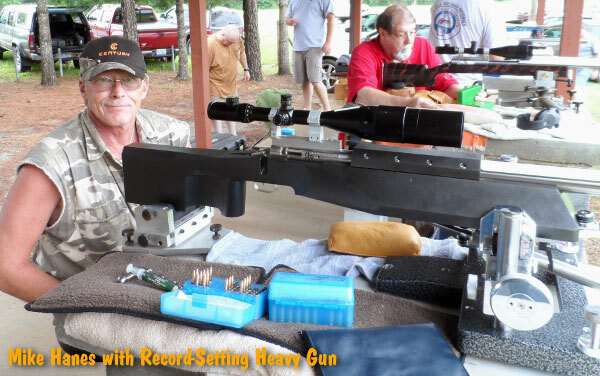 Three shooters have potentially broken four IBS 600-yard records (pending final approval) at the Piedmont Range in Rutherfordton, NC. Conditions were excellent and three shooters had outstanding multi-target performances. Mike Hanes, Chad Jenkins, and Randy Peele were tuned in and took advantage of the great weather. The entire day was overcast with a slight 3-5 MPH breeze, misting rain at times. It was one of the only days I can remember we could see bullet holes all day! In Light Gun, Chad Jenkins posted a 199 Score Agg, just one point shy of a perfect 200 score for four targets. Consider this — at 600 yards, Chad put 19 out of 20 shots into a circle 2.8″ in diameter, dropping just one shot out of the 10-Ring on four consecutive targets. That’s impressive. We believe this is the highest 4-target Score Agg ever shot with any rifle. (In Light Gun, Stephen Hall posted a 198 in 2012, and in Heavy Gun class Eric Wilson had a 198 in 2011). Chad took advantage of the good conditions to post his 199 score (with 1.954″ group size tie breaker). Chad was shooting a standard (not improved) 6mmBR with no-turn necks. Chad’s Light Gun features a BAT MB dual-port action, Shehane ST-1000 stock, Krieger 1:8″ twist barrel, and Leupold 45X scope. Chad has several hundred rounds on this rifle and has one other record with it. Chad has done a lot of winning the last couple of years with his 6BR. He shoots Berger 105gr Target VLDs in blue box Lapua brass, pushed by 30.3 grains of Varget and CCI 450 primers. Chad shoots with a modestly-priced Caldwell joystick front rest. Chad proved that you don’t need the most exotic equipment to set records. 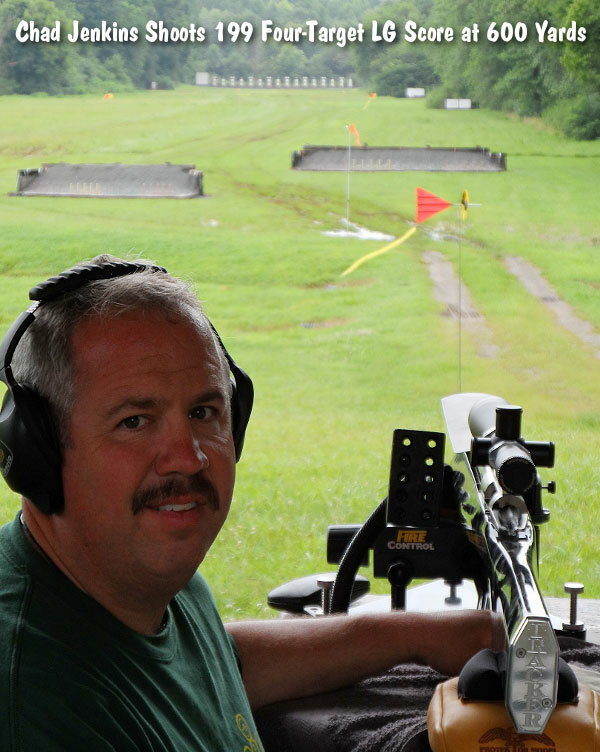 Later in the afternoon in the Heavy Gun division, Randy Peele was on fire. Randy posted a first in group (1.894″) and a first in 4-target score (198) against some fierce competition. This ties the HG score record and is just off the tie-breaker group by a few thousandths. It will be submitted to the IBS Record Committee also. Congratulations of some fine shooting guys! Share the post "IBS 600-Yard Competitors Set Multi-Target Records at Piedmont"
Late last night at Camp Perry, Ohio’s Hough Theater, Brian ‘Gunny’ Zins stepped atop the podium and raised the coveted Harrison Trophy above his head to the cheers of the crowd. He had just won his 12th NRA National Pistol Championship, twice as many as any other shooter in National Match history. At the dawn of the championship’s second day it looked like Zins might have to wait a year to reach the even dozen. During the first day’s matches he had made the mistake of only firing four shots in a five shot string. And, exactly ten points behind the then-leader, he was kicking himself. 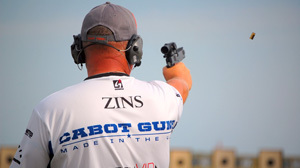 “Having a saved round in the .22 Caliber Championship was a rookie mistake that will hopefully never happen again — knock on wood,” Zins laughed. If history is any indication, it’s certainly possible. But it’s no guarantee. Camp Perry attracts the country’s top shooters and Zins’ titles aren’t all consecutive. Since his first championship in 1996, competitors other than Zins received gold in 1997, 1999, 2000, 2006, 2009 and 2011. 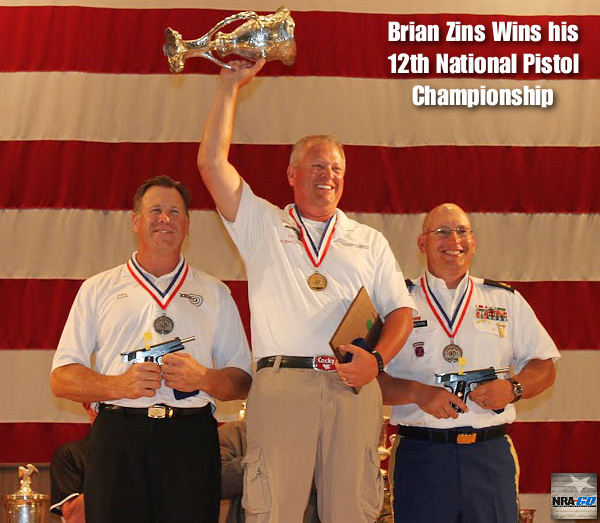 Share the post "‘Gunny’ Zins Does It Again — Wins His 12th National Pistol Title"